Florida – Wish You Were Here! I’m thrilled to have been selected to be part of a blogger group writing about Marriott properties throughout the state of Florida, as part of the “Wish You Were Here – Florida” campaign. 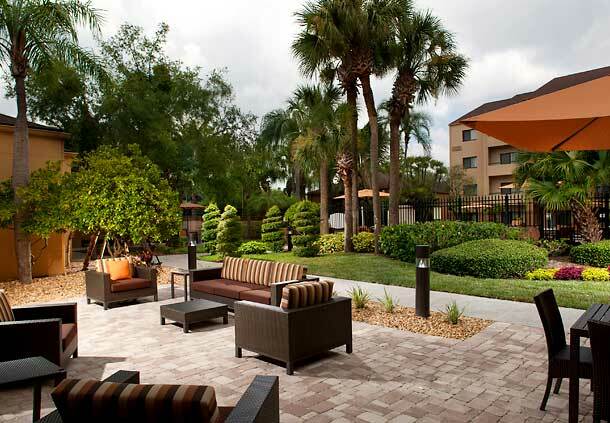 As part of the campaign, I’ll be staying at the Courtyard Tampa Westshore/Airport, just a few miles from my home, and I can’t wait to share my experiences with you! Courtyard Tampa Westshore/Airport’s outdoor space. Most people think of Florida as a vacation destination, but there are loads of business travelers, too. During my stay at the Courtyard Tampa Westshore/Airport, I’ll be mixing business and pleasure, looking at both sides here in the Tampa area. I’m looking forward to sharing my fun with you here on the blog! In the meantime, follow along with my fellow #FloridaWish bloggers and find out all the fun you can have at Marriotts throughout the Sunshine State. And be sure to check out the campaign’s Facebook and Twitter pages for even more fun! Many thanks to the Courtyard Tampa Westshore/Airport for hosting my upcoming stay.